I think Vulcan was originated primarliy for the European market. One week my local newsagent got copies of ‘Cobra’ by mistake which were actually Vulcan copies but in a foreign language (German I think). 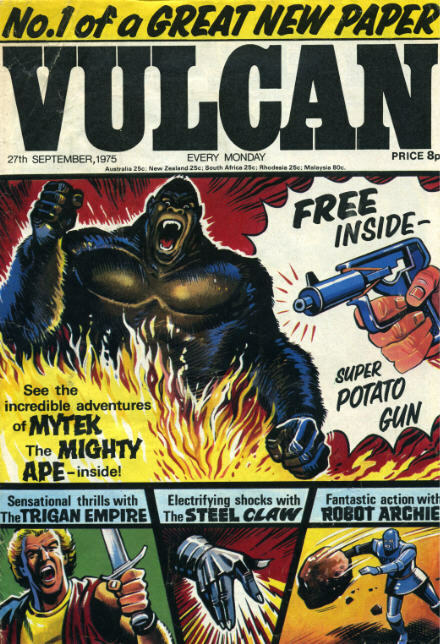 The American comics size was popular in weeklies in countries such as italy and I think Vulcan may have been a pan european approach to getting classic British strips available for the foreign market. According to a feature in the current reprint albums of trigan Empire from the Book Palace (highly recommended) Vulcan lasted an additional two years in Europe after it had ceased to be published in the U.K. which would have effectively repriented all the Don lawrence Trigan Empire. The covers of Vulcan (which seemed to be blown up panels from strips) were dire but the comic itself was superb with many clasic strips such as Kelly’s Eye, Steel Claw and Sabre(a tarzan rip off but with very dark atmosperic artwork.) The real treat of course was the Don lawrence Trigan Empire- 8 pages in full colour per week. There were , I think 53 weekly issues in the U.K. ( half of which were only available in Scotland), a softcover annual and a holiday special. It is something of an oddity in U.K. comics publishing but very special all the same. That makes sense. Today most magazines are printed across Europe with the same photos but in different languages.By the time “Vulcan” was published I had long since left British weekly comics behind and moved on to Warrens and similar. I continued to purchase random comics and annuals though (to this very day in fact…how sad is that?). I agree that The Trigan Empire was (still is) an amazing piece of work. I recall the first episode (1965?) where the spaceship (which looked like the one on the Dan Dare Annual) crashed on earth and the guy decoded the alien’s writing to unfold their planet’s history. An ambitious project for writer and artist!